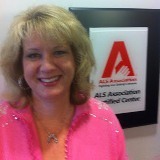 Alisa Brownlee, Clinical Manager, Assistive Technology Services, is an 18 year staff member the ALS Association working for both the Greater Philadelphia Chapter and the National Office. Alisa speaks, blogs, writes articles and uses social media to increase awareness of ALS and the use of assistive technology. Her specialty areas are communication, computer access, and electronic aids for daily living. She is a strong advocate for patient rights with elected officials, insurance companies, and other healthcare providers. Alisa is 2000 graduate of the California State University Northridge with a Graduate Certificate in Assistive Technology. She has a Bachelor of Science Degree in Hospitality Management and a Bachelor of Arts Degree in History from East Stroudsburg University. She is a Certified Assistive Technology Professional (ATP) through the Rehabilitation Engineering and Assistive Technology Society of North America (RESNA). She is a Board Member of RESNA (the Rehabilitation Engineering and Assistive Technology Society of North America) and is the Committee Chair of the 2014 RESNA Conference. She is also a Board Member of USSAAC (the United States Society of Augmentative/Alternative Communication). Most patients with ALS experience difficulty with speech and movement during the course of their illness. Some PALS (persons with ALS) will completely lose their ability to speak and to use their hands. The inability to speak is frustrating and emotionally devastating. My job is to use technology to get an ALS patient communicating so they can be an active participant in their family and community life, become more independent, and make medical decisions. There are many different electronic communication devices on the market. Some devices just speak for the person and some are desktop or laptop computer that not only speak for the person but also allow the user to have full access to computer functions. The easiest way to describe a communication device is that the user types on a traditional keyboard and a computer-synthesized voice repeats everything the user types into the device. Communication devices are referred to as “AAC”. The term “Augmentative/Alternative Communication” (AAC) refers to any mode of communication other than speech. When Medicare began paying for communication devices in 2001, they decided to refer to AAC devices as SGD’s—Speech Generating Devices. The acronyms are interchangeable). AAC includes systems such as sign language, symbol or picture boards, and electronic devices with synthesized speech. Although the same systems can be used for either augmentative communication or alternative communication, there is a difference between the two. Augmentative systems are used by people who already have some speech but are either unintelligible or have limited abilities to use their speech. In such case, other modes of communication are used to support, or supplement what the person is able to say verbally. Alternative communication is the term used when a person has no speech. These people must completely rely on another method to make all of their ideas, wants, or needs known. Electronic communication devices are used by anyone that can not make themselves verbally understood.Many different electronic communication systems are available. Some communication systems are custom designed for a specific user or can only be used in specific situations. For example, a communication system that works through a desktop computer cannot travel with the patient to doctor visits, but a laptop or notebook computer is more portable and will allow the patient to travel with the system. Electronic communication devices can be broken down into two categories: dedicated and undedicated systems. A dedicated device is strictly a communication device—the only thing it does is speak. Undedicated devices, which are computer based, not only speak, but also feature all the functions of a regular PC or laptop—word processing, e-mail, web surfing, etc. Voice output on a device is either digitized or synthesized. A digitized voice utilizes recorded human speech. Synthesized speech devices use computer- generated speech. There are pros and cons to both types of devices. Digitized devices, although more “normal” sounding, are limiting because they can only say the words or phrases programmed on the device. They do not allow for free- thinking. Synthesized devices allow the user to have pre-programmed phrases or words and also have the ability to spell out novel thoughts. Communication devices can be accessed several ways. The term access refers to the way the individual will operate the communication system. For example, one individual may use fingers for typing, with another moving the eyes to point at letters, thereby spelling words. An access method for an individual will often change as the disease progressively leads to weakening of different areas of the body. This means that a patient who at one point uses hands for communication may lose this ability and eventually have to use another access method. It is important for each individual to know that communication does not have to stop simply because hands become weak and typing is no longer possible. We have a significant number of PALS that use headmouse systems--a receiver is placed on top of the computer monitor and the user wears a reflector dot on their forehead in order to move the mouse around. Special software allows the user to "dwell" on a letter (timed stoppage on a letter) and the computer will then type the letter they are dwelling on. There are about three companies that make head mouse systems and they are about $500-$2,000 and are not covered under insurance for computer use. (they would be if they were part of a communication system but if the user simply wants computer access through a headmouse, that is not covered). If a patient can no longer use their hands to type, they would need to use a switch. A switch is used to operate a communication device when the individual does not have the ability to use his/her hands or fingers. The switch is connected to the electronic communication device and acts as a kind of control unit. When activated by only one touch or movement, the switch sends a command to the communication device to start or stop. Switches may be activated with any part of the body, including hand, foot, cheek, eyebrow, eyeblink, elbow, knee, etc. A switch is chosen according to a patient’s physical motor capabilities and should be chosen with the thought in mind that ALS is a degenerative disease and motor function will decrease as ALS progresses.